TEMPE, Ariz. — The Arizona Cardinals are the only team without a victory in the NFL. Their 0-4 start is the Cardinals’ worst since 1986, two years before the franchise moved to the desert from St. Louis. There were many bad teams in the intervening years but all managed to win one early. Still, there is a sense of optimism as the team prepares to face the 49ers in San Francisco, and it all stems from the performance of Josh Rosen in Sunday’s 20-17 loss to the Seattle Seahawks. 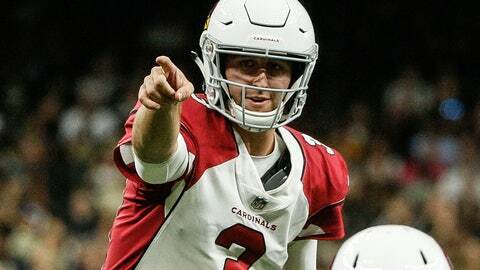 Rosen, in his first NFL start, completed 15 of 27 passes for 180 yards and a touchdown with no interceptions. The numbers should have been better because five passes were dropped. Two were by Larry Fitzgerald, difficult catches but ones he usually makes. And there was one apiece by Ricky Seals-Jones, Christian Kirk and J.J. Nelson. Nelson was behind the secondary and headed for a score with a long pass when it slipped through his fingers, costing at least 40 yards if not a touchdown. But Rosen encouraged his receivers through the difficulties. Fitzgerald loved what he saw from the 19th quarterback to complete a pass to him in his 15 seasons. Arizona also was able to get a little more from David Johnson, with the big running back lining up at wide receiver a few times. He finished with 112 yards from scrimmage, 71 rushing and 41 receiving. But there were enough problems on offense and defense to lead to another loss, culminating with Phil Dawson‘s missed 45-yard field goal with 1:50 to play and Seattle’s late drive for the game-winning field goal. So how does the team dig out of this 0-4 start? “I keep going back to Josh, I’m just so encouraged based off of what I saw yesterday,” Wilks said. “I think you guys saw the potential of pushing the ball down the field, which we haven’t had in the first three weeks of the season. We’ve got to finish now. Those guys are wide open; they’ve got to make those catches. Notes: Wilks said he expects Andre Smith to be back at starting right tackle. Smith has missed the last three games with an elbow injury. … Wilks said he expects to continue using Mike Glennon as the backup quarterback. Sam Bradford was inactive Sunday.